Welcome to ELPH’s Dog Fostering and Adoption! ELPH is extremely passionate about rescuing puppies/dogs and it’s all thanks to one very special dog named Goliath. Back in January of 2013 ELPH was fortunate enough to meet this amazing Great Dane named Goliath. He came to Erin through a message on Facebook because a very skinny Goliath was spotted sitting in a car in a parking lot. Once Erin saw the picture of him.. Goliath was on her front-step within the hour. 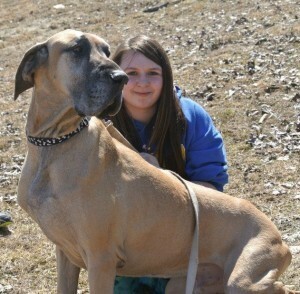 He only weighed 105 lbs and Great Danes are suppose to weigh at least 180 lbs! As soon as the ELPH gang met Goliath he stole everyones hearts… immediately! Sadly, Goliath passed in April of 2013. He truly was one in a million and he will be forever missed. To honor Goliath ELPH now helps foster puppies and dogs through the Vermont Dog Rescue. The more people who open up their homes to fostering pups the more we can rescue together.